Of this video—an hour and a half long bass lesson and interview with the late, great jazz bassist Jaco Pastorius—one youtube commenter writes, “this isn’t a bass lesson… this is a bass humiliation!” It’s an apt description—for the aspiring player of any instrument, watching Pastorius at work is a humbling experience. Even Jerry Jemmott, no slouch on the instrument, seems a little overwhelmed as he interviews Jaco. But the articulate—and personally troubled—bassist was a humble guy, more than willing to share his skills and knowledge. As a player, composer, and producer, Pastorius towered over other progressive jazz players in the 70s and 80s, accompanying names like Pat Metheny and Wayne Shorter. He was also a member of fusion powerhouse Weather Report, a solo artist, and one of the most in-demand session players and producers of his time. While bass players get too little recognition in rock, in jazz, the instrument has always commanded a degree of respect. But Pastorius took electric jazz bass to a place that belongs entirely to him, playing bass and melody parts at once on the instrument and incorporating mind-blowingly nimble solos and high runs into original compositions and standards alike. I came to Pastorius late in my musical education thanks to his influence on English bassist and electronic producer Squarepusher (Tom Jenkinson), who, since the mid-nineties, has fused his own frenetic Pastorius-like bass licks with the stutter and clatter of drum-and-bass. In 2009, Squarepusher had the effrontery to release a live solo album consisting only of electric bass compositions, a move that would have been impossible without Pastorius’ precedent-setting solo work. Pastorius turned the electric bass into a lead instrument. His first solo album, the self-titled Jaco Pastorius (1976), broke ground with original compositions for bass guitar and bass transcriptions of songs like Charlie Parker’s “Donna Lee.” At that time, no one had heard anything like it. 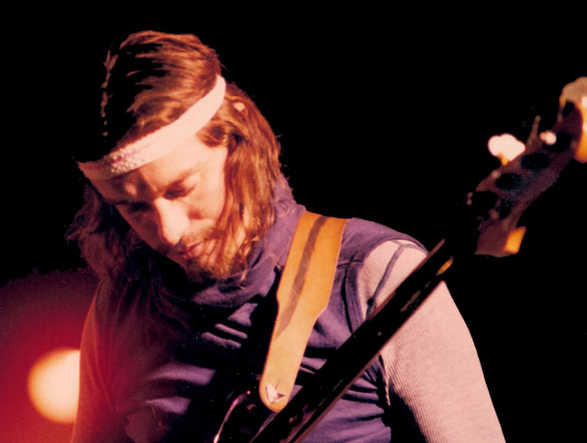 Pastorius, who suffered from bipolar disorder, died of wounds sustained in a bar fight on September 21st, 1987. In honor of the 25th anniversary of his death, revisit the man and his method in the video above, and geek out to Jaco’s live performance at the 1982 Montreal Jazz Festival. Josh Jones is a doctoral candidate in English at Fordham University and a co-founder and former managing editor of Guernica / A Magazine of Arts and Politics. I have that method on VHS and Audio cassette and I remember it was my most prized possession after my fretless Fender Precision dated 1976! I can never forget the sense of wonder, seeing how fast and precise Jaco was: I had listened to many of his tracks by that time, but to see him in action was a mind-blowing experience. And yes, Jerry Jemmott (who was a solid musician) seemed like a pupil in front of his master, when dueting with him. When in the right state of mind, Jaco was probably a quite approachable, down-to-earth guy, as many of his peers testify: Peter Cetera spoke fondly of their first meeting, for instance. It was a crying shame his career and his life had to spiral down over the years like they did. RIP to one the heroes of my youth! Hi there-this is just to say a VERY big Thank You for all the hard work you guys put into the OC blog. I am the librarian at a boys’ school in Pretoria, South Africa and yours is the first feed of the day which I check. My music teachers love your stuff, obviously, but there is so much richness and variety that there is generally something for everyone. I often download the clips and put them on the school server for teachers to use in class (which they sometimes do, amazingly ) and I very often pass on blog posts to other school librarians on a national listserv. I know that sometimes when writing a blog one wonders if anyone out in cyberspace ever reads or uses one’s material, but rest assured that here in The South we are Massive Fans!